In just 4 guitar lessons you’ll learn all the essential techniques to play the guitar, with alot of fun along the way! You’ll even learn some cool riffs! Our home course is fun, engaging and simple, all course paperwork is provided, with further online YouTube catchup tutorials available outside of class to help you with your homework, avoiding confusion and making sure you’re learning the right way. For kids and adults we have courses catering for beginners through to advanced. Use our courses below to find out more and get in touch through our contact form. Professional guitar tuition in the comfort of your home. 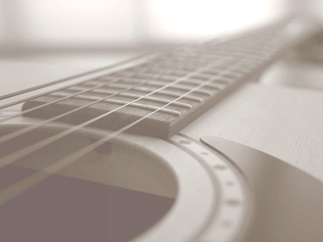 Master the basics, gain confidence and learn the songs you love in our Beginner Guitar Lessons Crawley course. Suitable for all ages, kids guitar lessons and adults. Introduce your child to the world of music with our Kids Guitar Lessons Crawley! Your child will benefit from weekly homework, a structured syllabus and regular progress reports while keeping their learning on track. 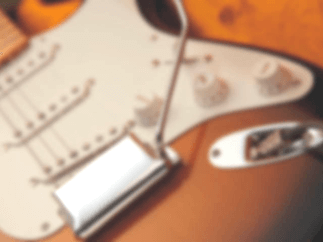 Become the best player you can be with our Electric Guitar lessons Crawley. From basic legato techniques to tapping, shredding and sweeping arpeggios, we’ll help you gain the skills to help your guitar playing stand out! 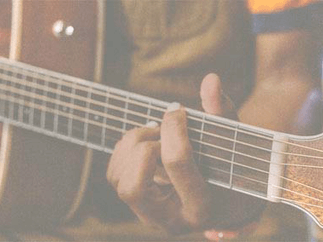 Either playing guitar with friends on a lazy day or becoming the next Ed Sheeran, let us teach you the skills you need to take your acoustic guitar playing to the next level with our Acoustic Guitar Lessons Crawley. For kids 6-11 years, your child will learn from our Rockschool course, an official UK regulated exam syllabus. For your convenience we teach in home guitar lessons and our kids learn from the graded Rockschool course, grades 1-8. Your child has fun at home and there’s no need to travel. We come to you! Learn the easy way with simple chords and techniques, leading onto learning the songs you love! Our private adult home guitar lessons in Crawley are taught as a bespoke course tailored to the individuals tastes and requirements. Tell us more about the music you love and how we can help! Want to to learn electric guitar and shred? No problem. Always dreamed of learning acoustic guitar ballads? No problem. Our lessons cover all classic and modern techniques on acoustic and electric guitars, just tell us what you love and we’ll teach it! We can teach you ANY song you love. Tell us and we’ll build that in your weekly guitar lessons! Lately we’ve taught songs by Metallica, Ed Sheeran and George Ezra. We get to know our students really well and build great relationships. As a result, we regularly host special group lessons by gathering students of similar musical interests and abilities together to have a ‘super class’ ! 6 string fun is had and friendships are made! 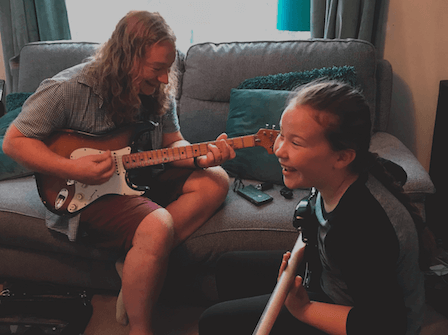 In addition to our regular one-to-one guitar lessons in Crawley we also hold ‘The Guitarist Breakfast Club’ where we get together for an hour and work on technical exercises and riffs as a group guitar lesson. This helps our students get more technical ability but with other students to help. “I booked a lesson with Matt when looking for guitar teachers near me & instantly became hooked. Lessons are always different, fun & rewarding”. “I never dreamt I’d be singing and playing guitar to my own song after just 4 lessons. Looking forward to more”. “Full of enthusiasm, support and patience, excellent in encouraging me to learn at my own pace”. We won’t bite! Book your trial guitar lesson with us today! YOU’RE NEVER TOO OLD TO LEARN GUITAR! ” I loved that he asked me what kind of music I wanted to play, but also encouraged me to play songs that pushed my skills. I enjoyed every lesson. Rock onnnn! !”.